1929. Lifeboat Building at West Cowes, Isle of Wight. 1929. The Shipyard, East Cowes, Isle of Wight. 1929. 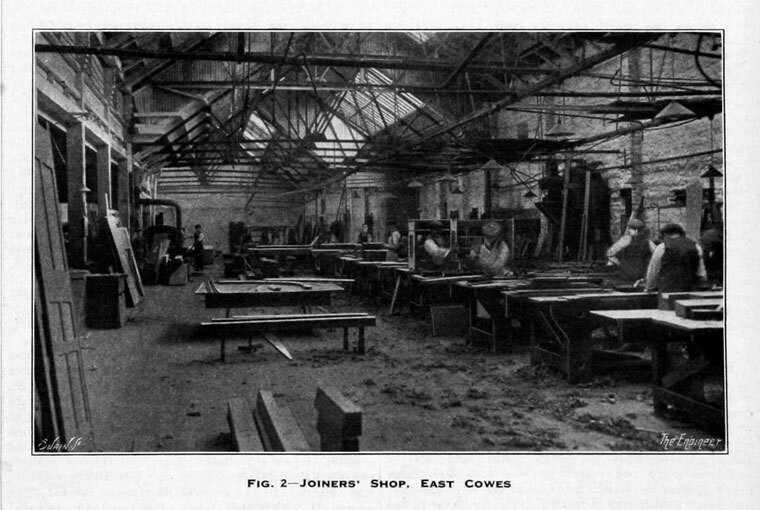 Joiners' Shop East Cowes, Isle of Wight. 1929. 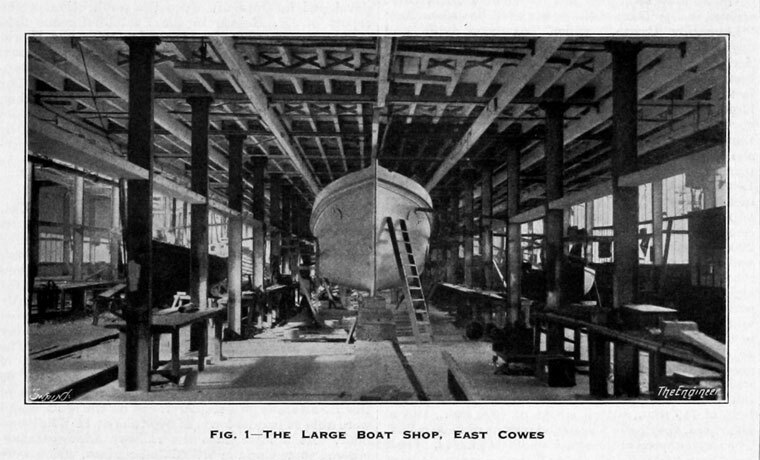 The Large Boat Shop, East Cowes. 1929. The Shipyard and Engine Works, Cowes. 1929. 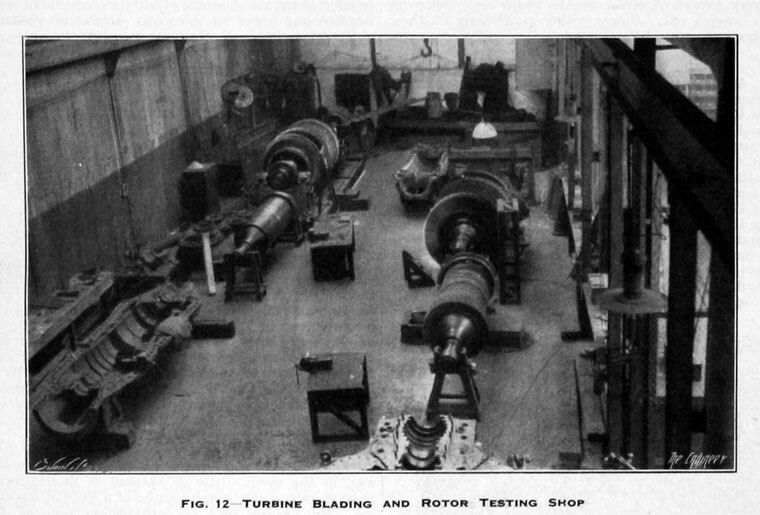 Turbine Blading and Rotor Testing Shop. Cowes. 1929. 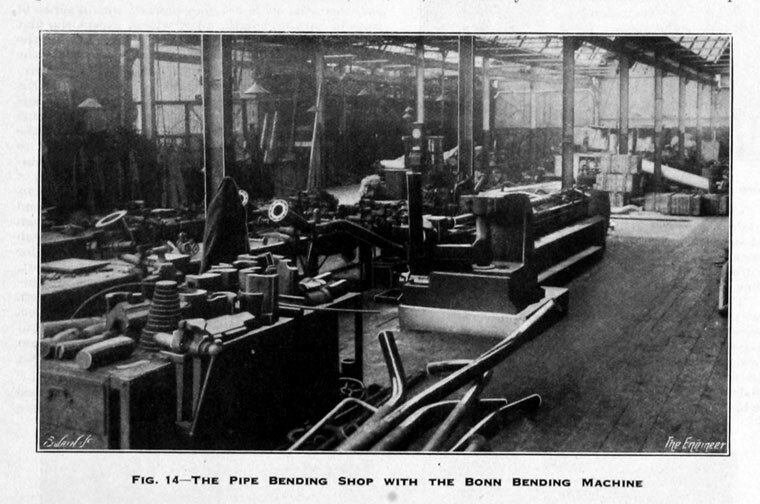 Pipe Bending Shop with the Bonn Bending Machine.Cowes. 1929. 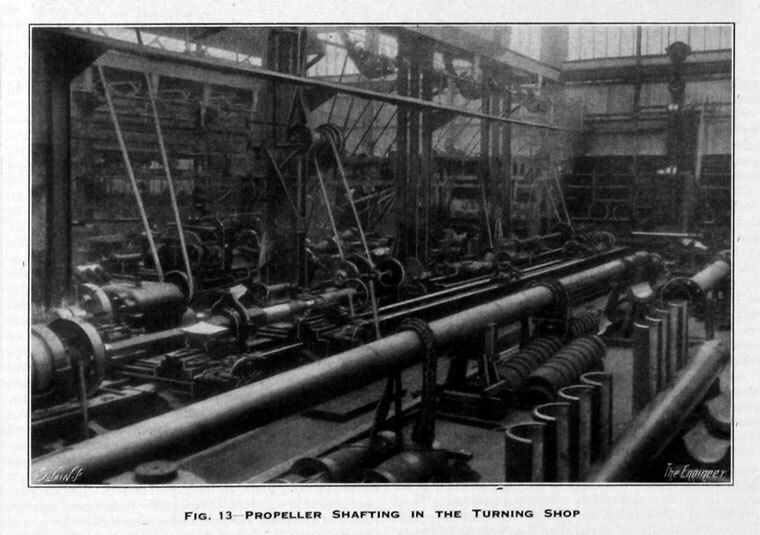 Propeller Shafting in the Turning Shop. 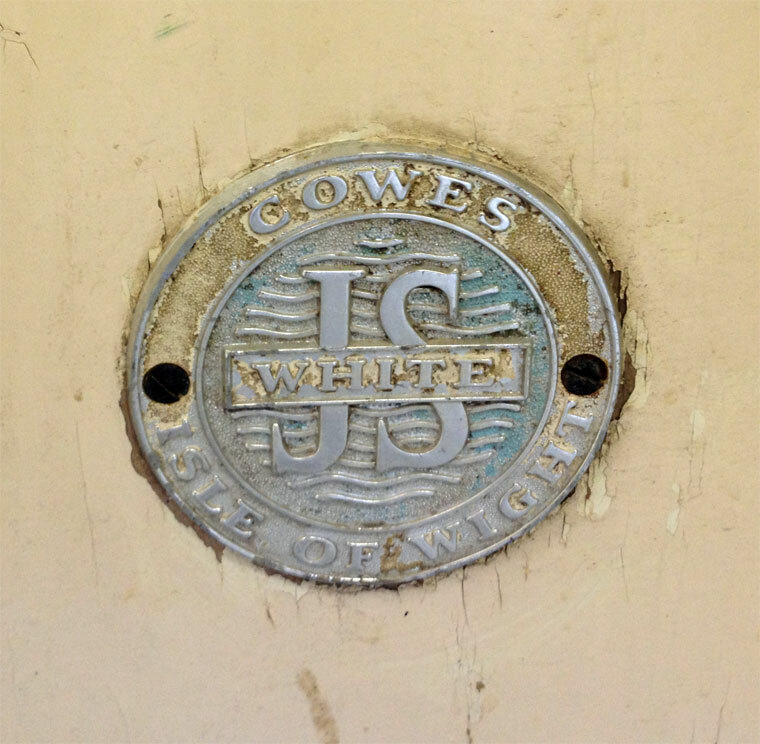 Cowes. 1933. 24 B.H.P. 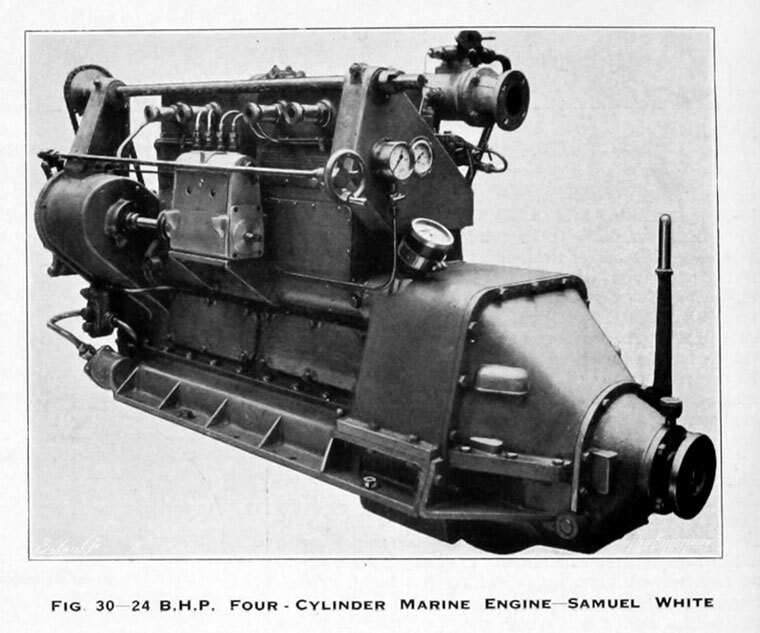 Four Cylinder Marine Engine. 1951. 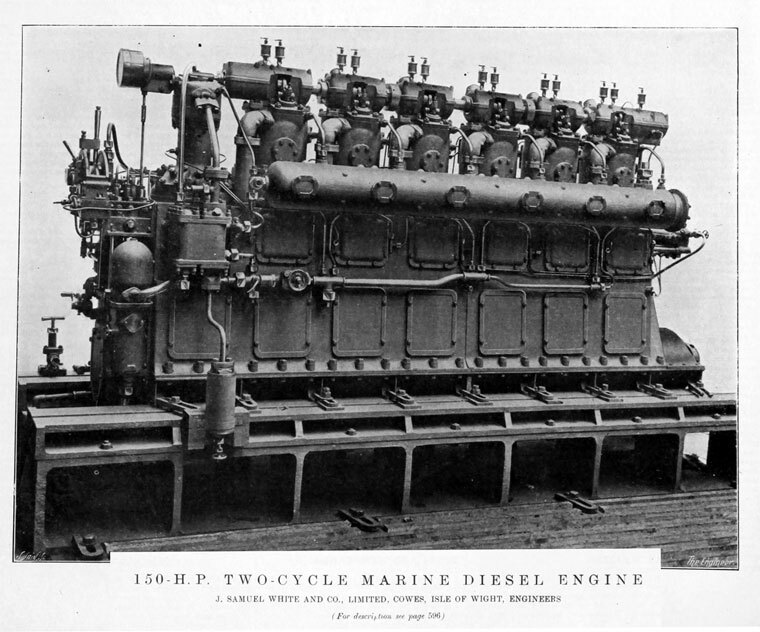 Marine steam turbines, land and marine water-tube boilers, oil fuel burning equipment and Clinsol strainers. 1960. 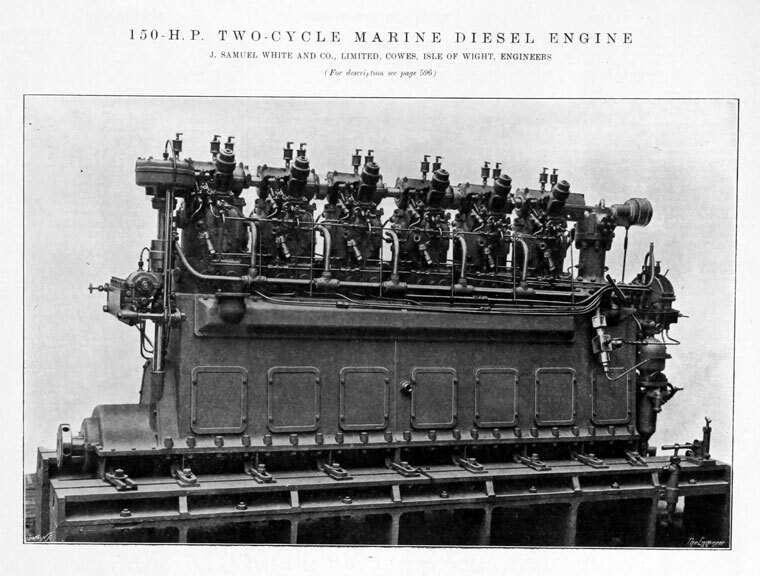 Marine steam turbines, land and marine water-tube boilers, oil fuel burning equipment and Clinsol strainers. c 1950's (?) 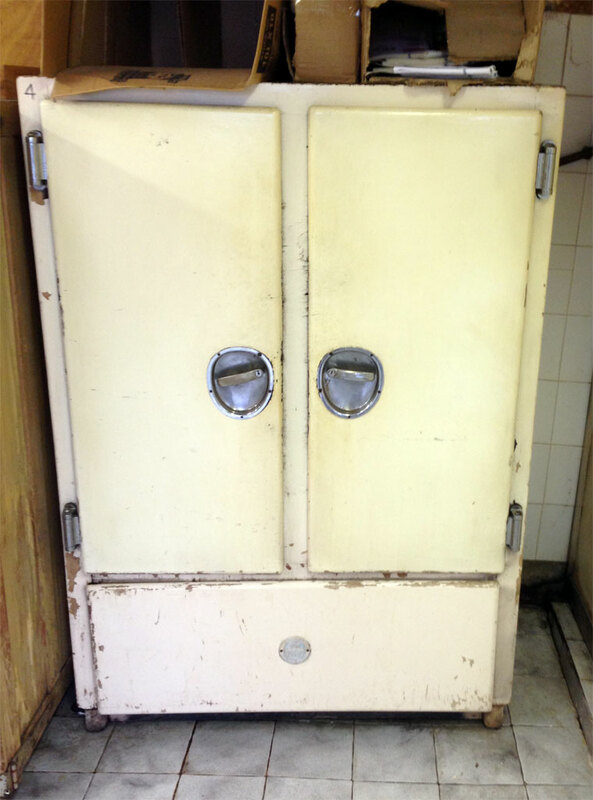 refrigerating unit. 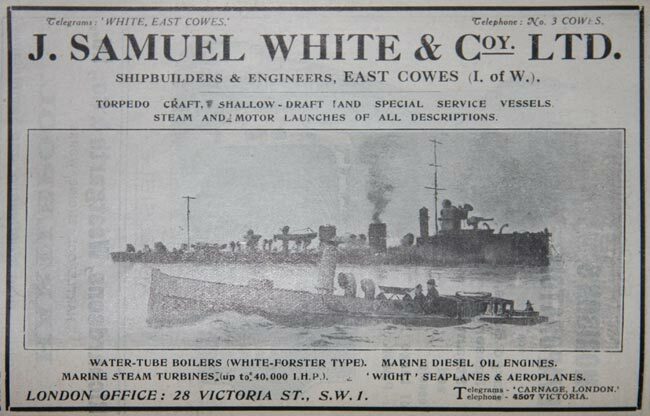 J. Samuel White (J. S. White) of Cowes, Isle of Wight was a British shipbuilding firm. 17th century: Whites were building ships at Broadstairs for the Iceland fisheries and the Russian trade. 1746 John White was head of the firm. 1802 In his book "Wight, Biography of an Island" Paul Hyland explains that the company moved from Broadstairs (Kent) to Cowes in 1802, where they began work on the 'Thetis' Yard on the 'salterns' and marsh between the Medina and Arctic roads. 1805 Company was founded by John White. For some years, John White constructed small, special lifeboats. Records indicate that by the 1850s White's docks, with its steam sawmills and engine shops, and the mast and block shops, provided work for around 500 craftsmen. 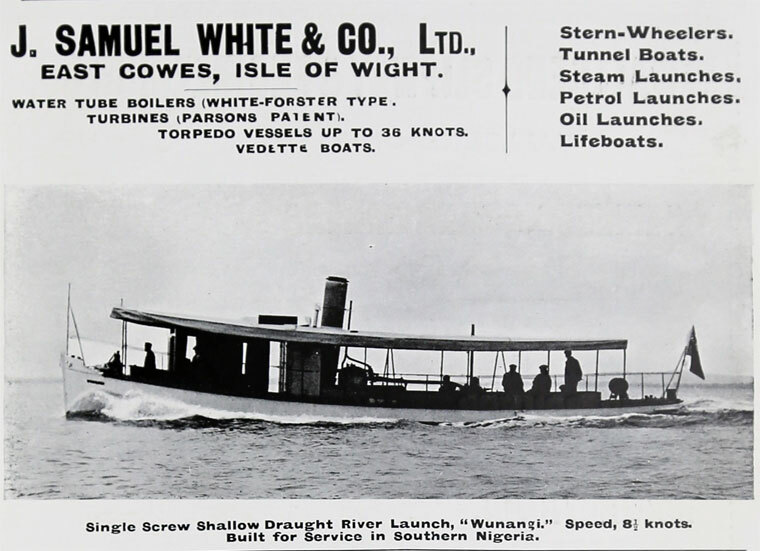 1856 Messrs John and Robert White, shipbuilders of Cowes, subscribed £20 to the Smith Testimonial Fund, commemorating the work of F. P. Smith in promoting the screw propeller. 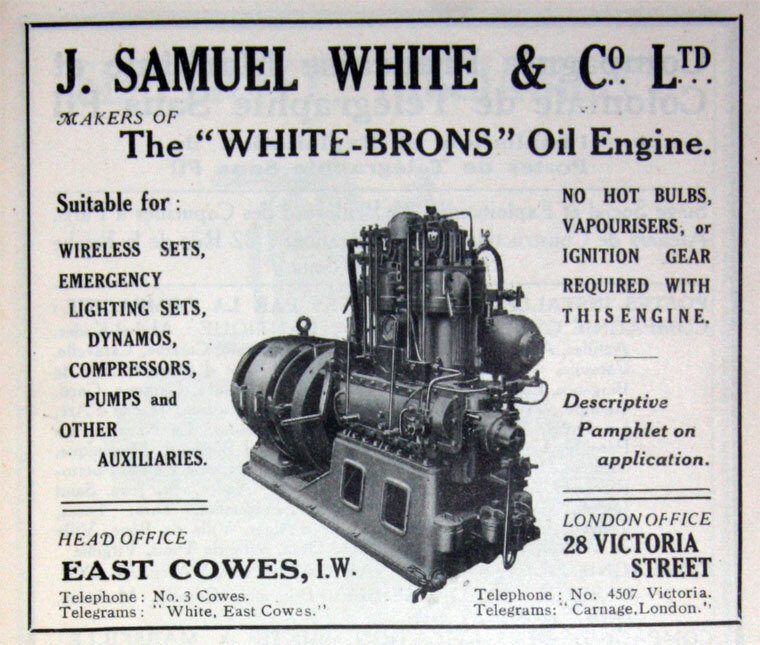 1864 John's son, John Samuel White, had the idea of applying high speed engines to the lifeboats. 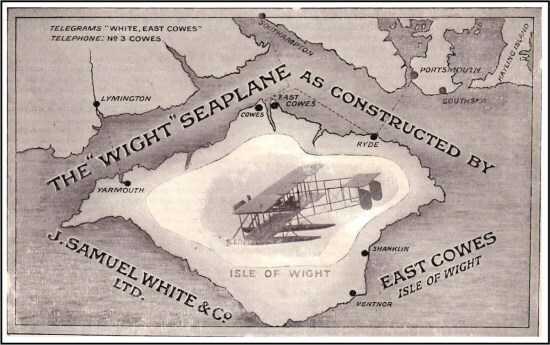 He collaborated with George Belliss of Birmingham to implement this, with work conducted at the Falcon yard in East Cowes. 1880s The shipbuilding, which established the reputation of the yard, began in the 1880s when the company expanded into a number of yards. By the mid 1880s the yard's repertoire consisted of torpedo boats, yachts, pinnacles, cutters, small sailing ships and composite paddle steamers. 1889 Took over John White's Medina Dock Works, on the opposite side of the Medina to Falcon Works; used for engineering work and construction of small steam ships. An engine building department was later established there. 1891 Became a Private company. 1894/5 The company's Falcon yard built its first destroyers for the Royal Navy. 1896 Andrew Forster was appointed chief draughtsman and manager's assistant, later becoming Engineering Manager. 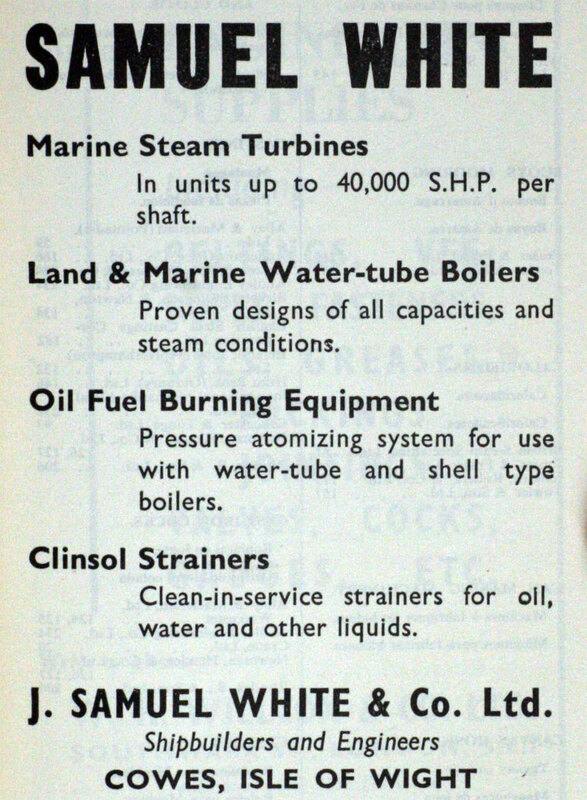 Forster invented the "White-Forster" water-tube boiler, and the "White-Forster " automatic feed-water regulator, and the "Dummyless" turbine, etc. 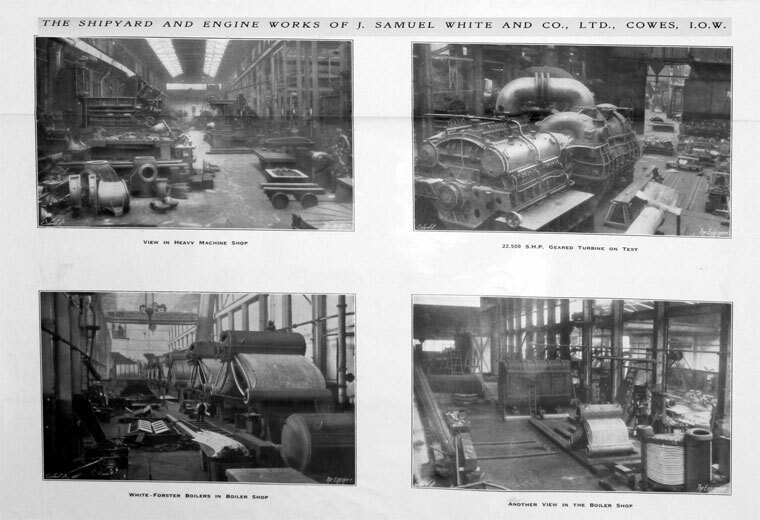 1898 Incorporated as a limited company: J. Samuel White and Co Ltd. 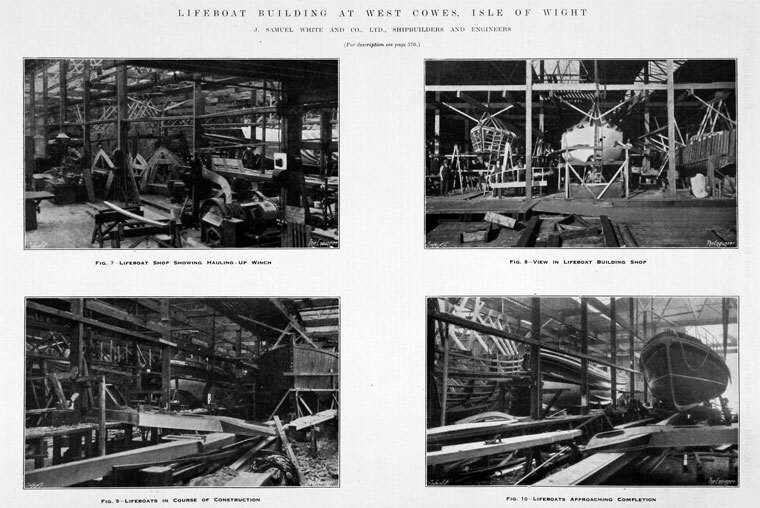 The company expanded further with the regular construction of turbines, boilers, steam and diesel engines; the west Cowes site became an engineering works. 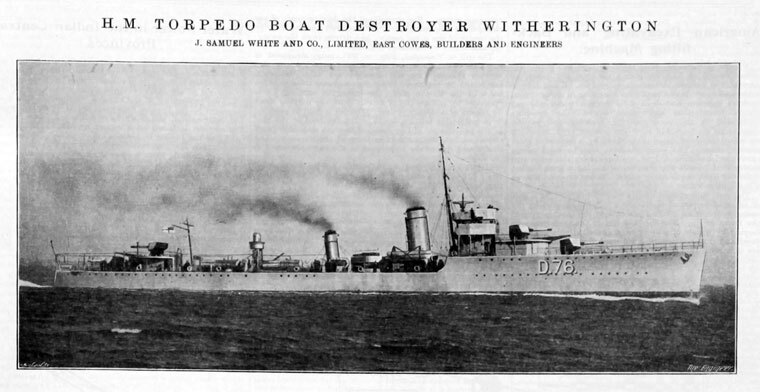 1905/11 Twenty five destroyers were completed between 1905 and 1911, fitted with the White-Forster water tube boiler which was a speciality of the company. 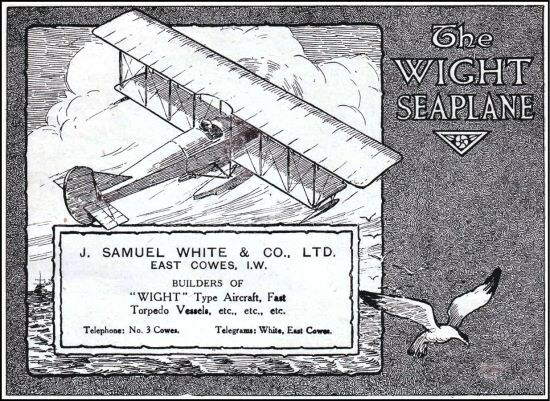 1910s Built the Wight seaplane in various forms. 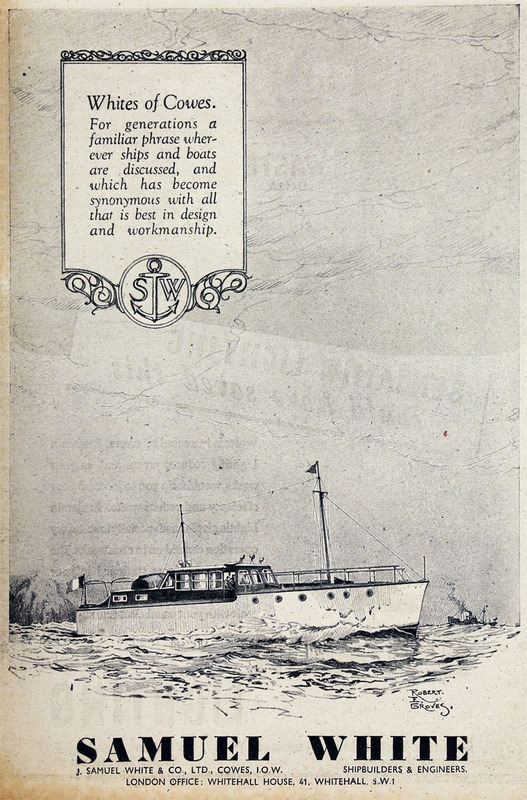 1913-1917 For a list of the models and prices of Marine Motors see the 1917 Red Book under the White-Brons name. 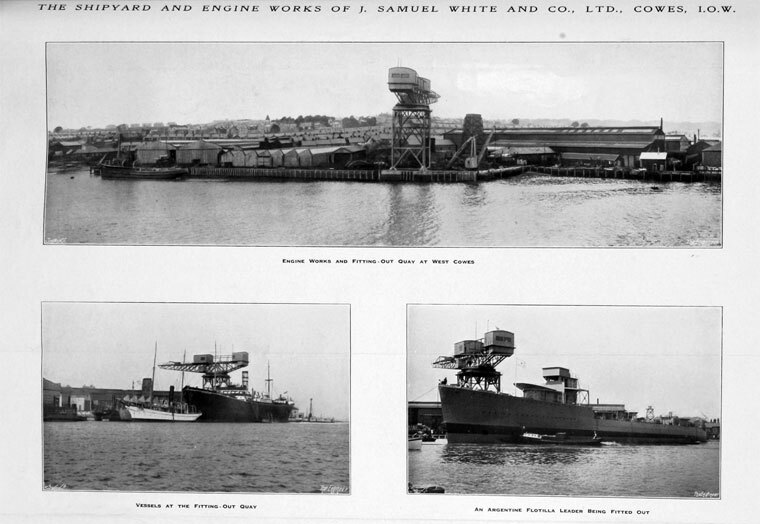 WWI During the War, the yard built 16 destroyers, five patrol boats, six "Q" ships and two submarines. 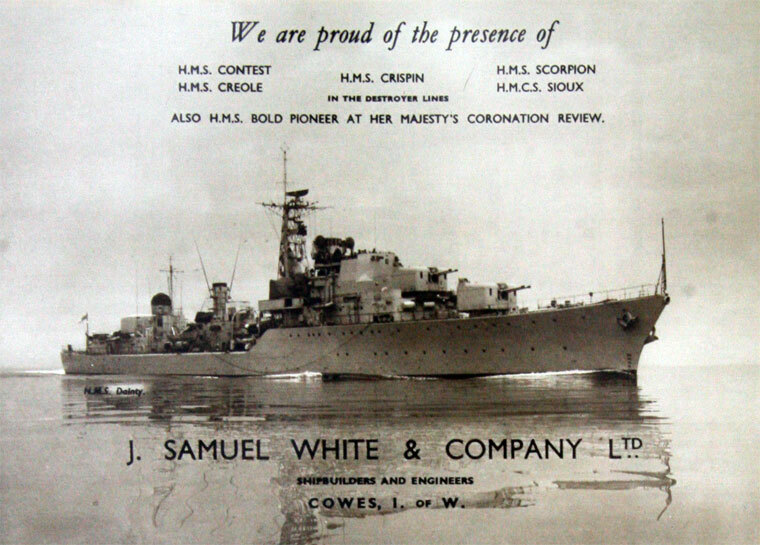 The company's Howes yard also produced a number of destroyers in record time by increasing its workforce and modernising its fitting out facilities. 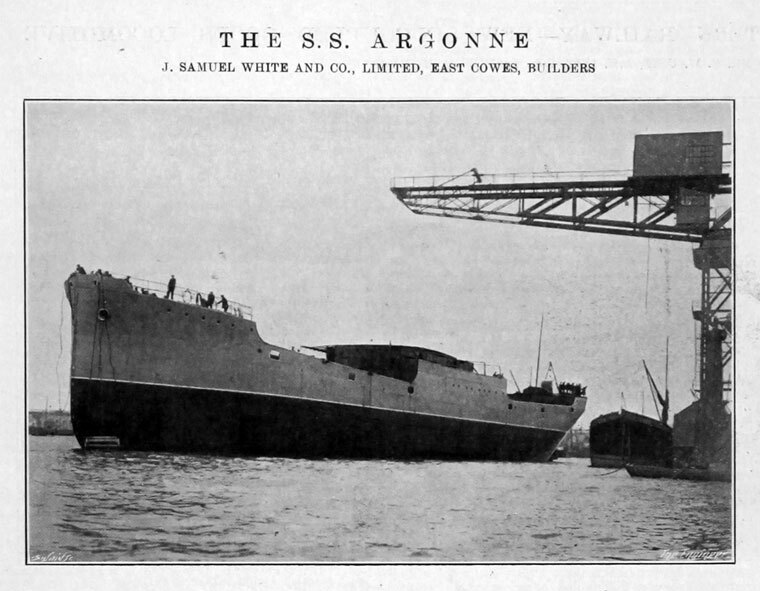 Built a new factory at Somerton, near Cowes which after the war was sold to Selsdon Aero and Engineering Co.
1920s The Cowes yard moved into merchant ship production as war ship orders had dried up. 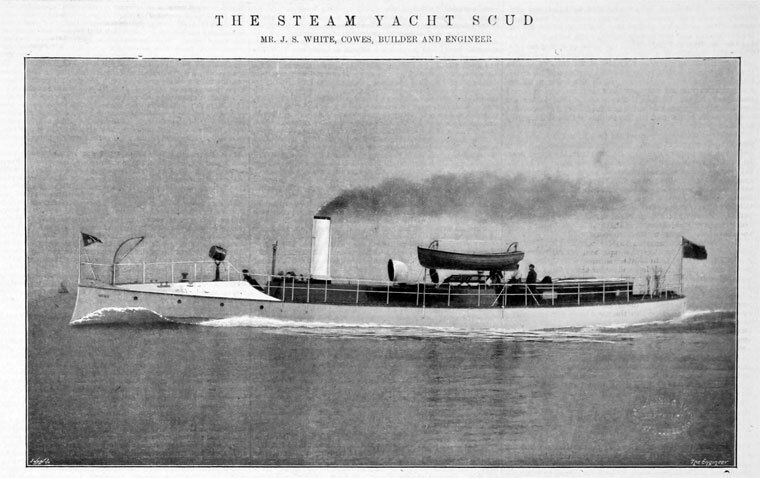 There was a slump in merchant orders too, and this led to the yard accepting orders for small ships: tank barges, excursion steamers steam yachts and ferries. 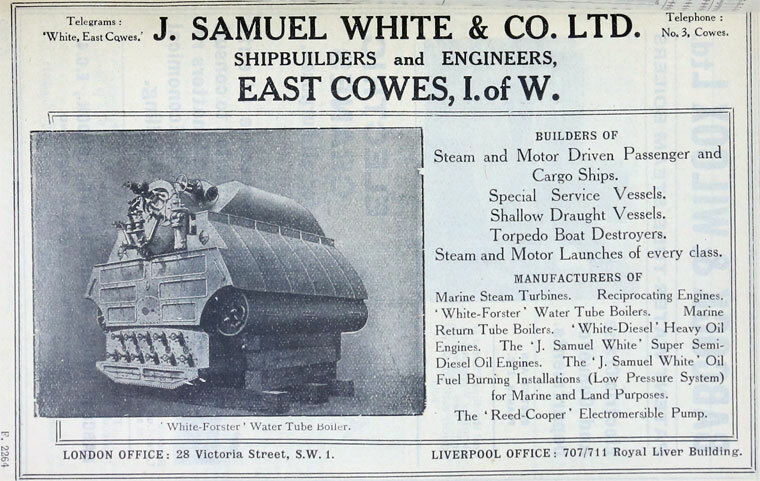 1924 Advert says they are shipbuilders and engineers and lists a range of products. 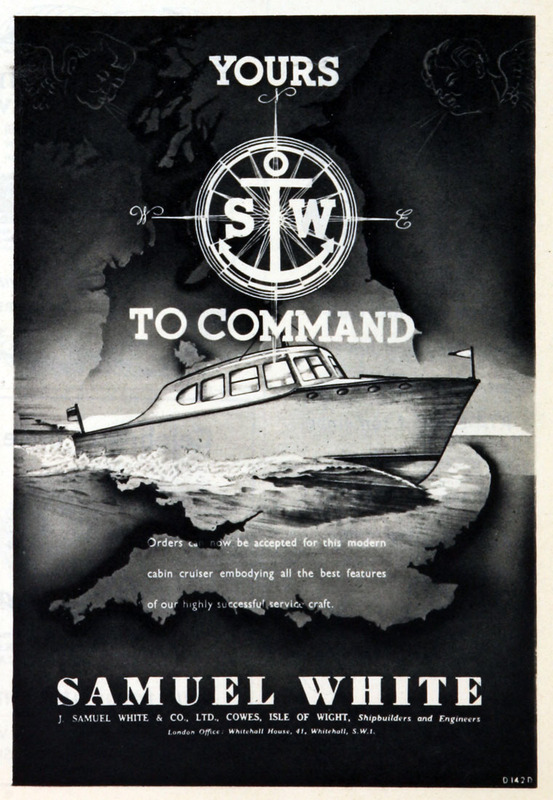 1928 New orders for warships began coming in from 1928 onwards. The company survived the Depression thanks to its established ship repairing yard in Southampton. 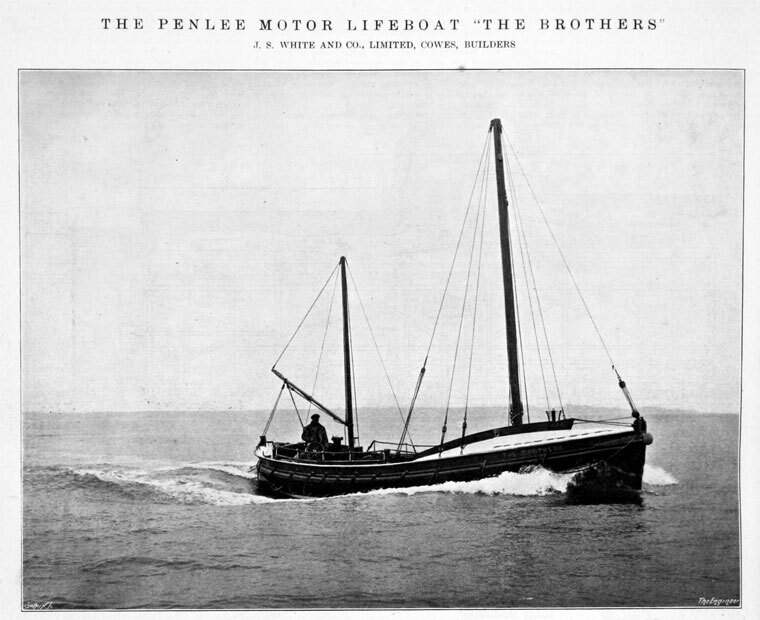 The company also had a separate lifeboat production line, which kept the income stream flowing. 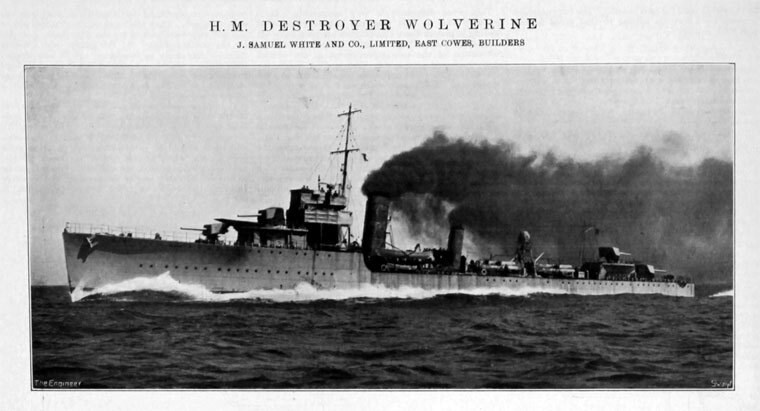 From 1933 onwards fresh orders for the Royal Navy invigorated the fortunes of the yard: destroyers, gunboats and mine-layers were made during this period. WWII Manufactured parts for the De Havilland Mosquito. 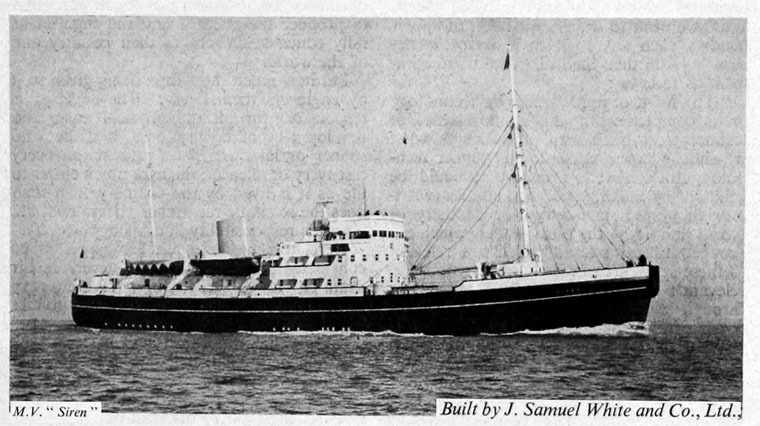 1950s In the post war period, the yard returned to merchant ship construction and made turbine powered ferries, refrigerated fruit ships and survey vessels. However, in the Cowes yard frigates, destroyers, warships, patrol boats, lighthouse tenders and minesweepers were completed. 1960s The 60s were typified by the building of large ferries. 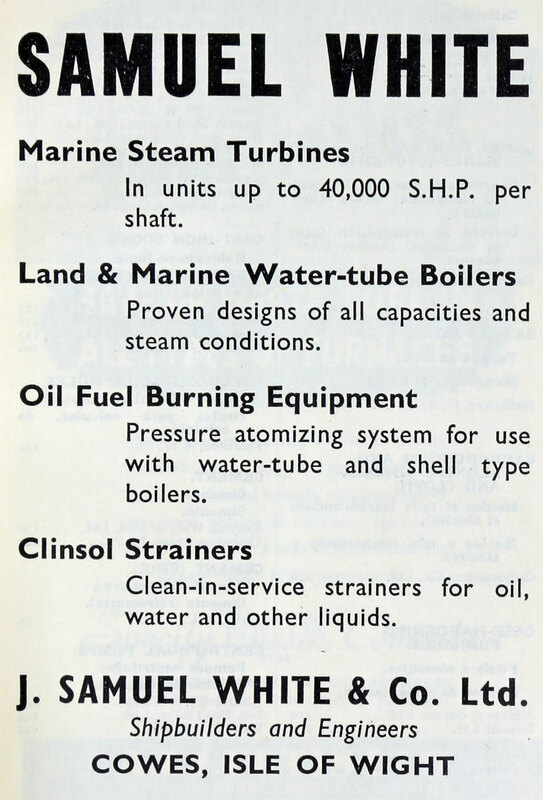 1961 Shipbuilders, boilermakers, marine engineers; makers of turbine machinery, oil fuel plant and plastic boats. 2,500 employees. 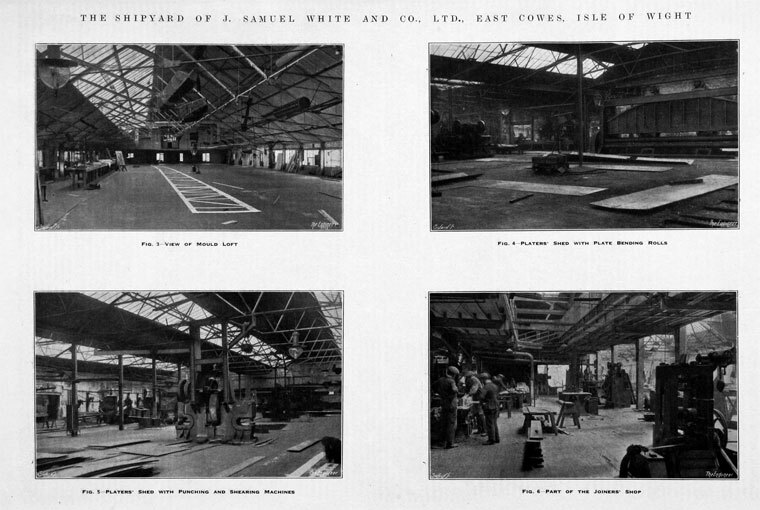 1964 However, as other yards moved towards prefabrication techniques, the East Cowes yard was closed in 1964 as it was not possible to update its facilities. 1972 The West Cowes yard continued its engineering work until 1972 when it was bought up by the Elliot Corporation of the USA for the production of turbo-compressors. Wight Converted Seaplane - bomber floatplane. Two-crew biplane powered by 275 hp Rolls-Royce Mk II or the 265 hp Sunbeam Maori. 37 were built. 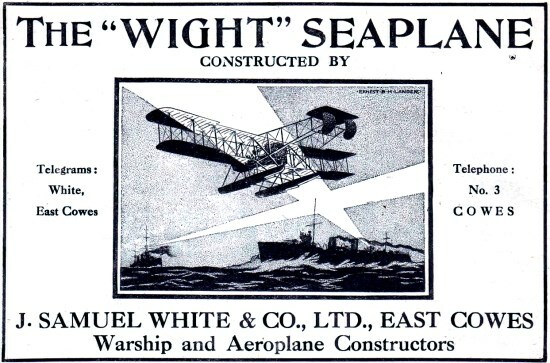 Wight Pusher Seaplane - floatplane. 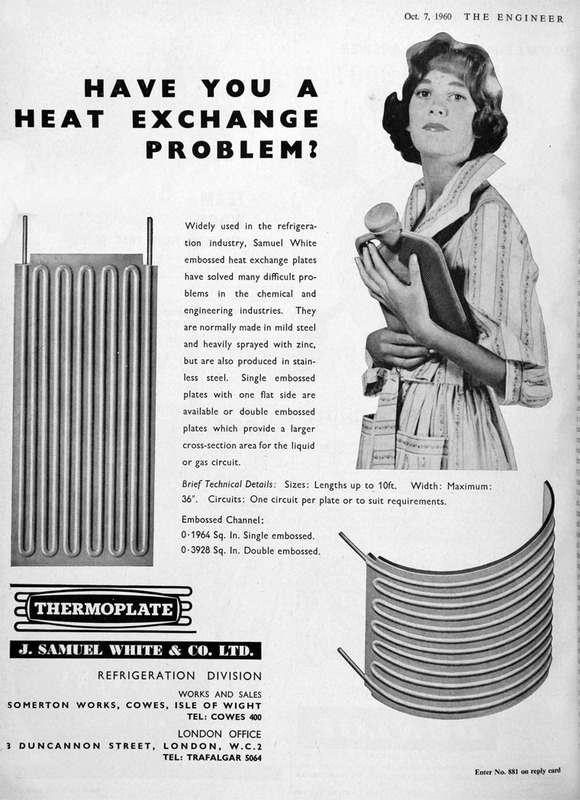 By the 1950s the company was making small refrigerators (see photo) and Thermoplate heat exchangers. This page was last edited on 25 March 2018, at 14:15.